Ingrid has created an entire series of educational video material to help you and your cats. Everything from trimming your cat's nails, to foraging videos, examples of normal cat behavior and even some clicker training clips can all be viewed here. These How-To videos are available to help you better care for your cat. Need a tutorial on medicating, giving SQ fluids, not sure where to place your new scratching post, want to DIY the best litter box? It is all here in the How-To videos. Ingrid and Asia during the Cats 101 filming. This series of videos will illustrate a wide array of foraging toys for cats. You will get to see how the toys are utilized and manipulated so that you can get a better feel of what you should offer your cat based on their skill level. Hopefully it becomes quite obvious how fun, challenging and enriching foraging can be for your cats. Ingrid recommends this feeding technique to many of her clients. 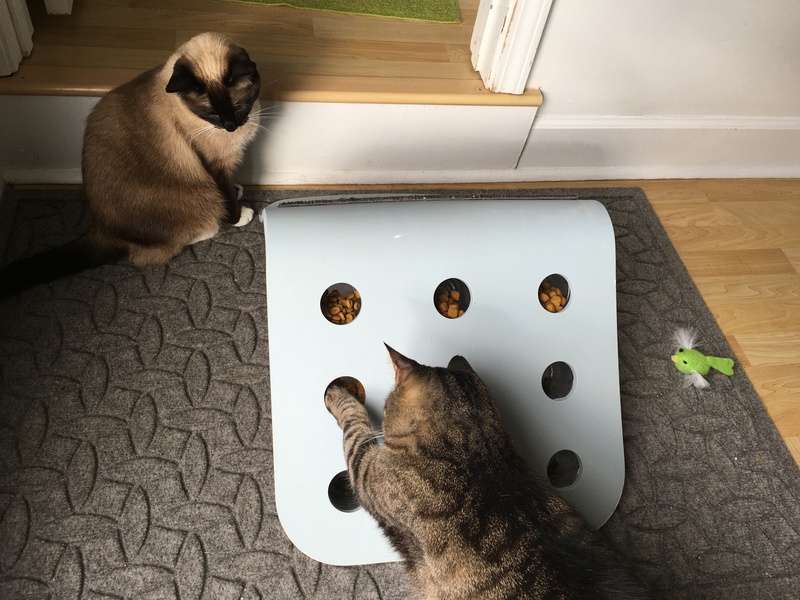 Hitch and Willow taking a crack at the IKEA hack foraging toy Ingrid made. Training a cat is possible! In fact, it's quite simple! Teaching your cat to come when called or enter their cat carrier on command can literally be life saving! Teaching basic commands and tricks such as sit, hi-five, shake hands, etc. can be enriching mental stimulation, a great way to strengthen your bond and a way for you both to simply understand each other better. Training resources: The Trainable Cat and Naughty No More! Willow cruisin' on her skateboard. Ingrid has taught many cats to skate! This segment shows cats doing normal, everyday behaviors that are often misinterpreted by the untrained eye. We humans still have a lot to learn about cats and why and how they do certain behaviors. One common theme is normal cat play behavior being misconstrued as aggression. There are also videos on fun and unique enrichment ideas to help you provide an ever changing and exciting world for your cats all while being safely indoors! Soren and Willow in the midst of a wrestling match.